Start automating and controlling your appliances using the Decora Smart Wi-Fi Plug-in Outlet. Use the free My Leviton iOS or Android app to add/name devices and to control them individually or as a room with a single button push. Create schedules, scenes, and customize your experience as desired. Rated for motor loads up to ½ HP including appliances, lamps, fans, fountains, and more; no new wiring required. A five year limited warranty supports Leviton Decora Smart Wi-Fi products. Decora Smart devices are designed for countries which follow NEMA standards including the United States, Canada and parts of South America. Customize your experience with adjustable fade rates, maximum/minimum illumination levels, and more if desired. 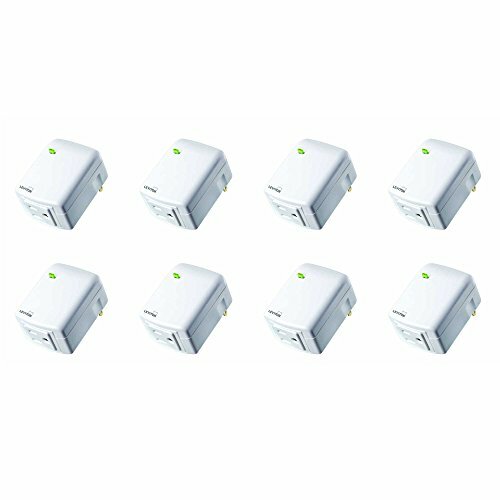 Ideal for any residential setting where remote ON/OFF switching of appliances, motor loads up to 1/2 HP, or freestanding lights, including LED, Incandescent, Inductive, Fluorescent or Compact Fluorescent loads is needed. Typical applications include switching of lamps, portable fans, kitchen appliances, indoor fountains and more.Reduce energy consumption, provide dramatic scene transitions, and utilize the affordable plug-in for wireless control of lamps, small appliances, holiday lighting and more. Compatible with all products that support Amazon Alexa providing voice control of the load: “Alexa, turn on living room lights”. Alexa devices (including Echo, Dot, and Tap) sold separately. Alternately, utilize Google Home, a voice-enabled speaker powered by the Google Assistant, to easily control smart devices as well as interior and exterior lights around the home. "Ok Google, turn [Everything] On/Off"